Oooooh, wasn’t it chilly this morning? A frost-scraper of a morning for those of you that drive, and a finger-freezer of a morning for those that travel by other means and forgot their gloves. As they flit about the trees. Scares the birdies from the trees. Or maybe it was a second verse? Anyway, I was delighted when my pals on Facebook replied to my efforts with little rhymes of their own – isn’t it lovely how the Rhyming Bug can wiggle its way into other people heads, and make them rhyme too? I had to share this one with you, penned by my friend Jon – it’s soooo sweet, and really made me smile! 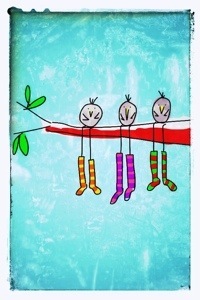 To warm the birdies’ toes. Cheers for planting the image in my head Mr Jordan!